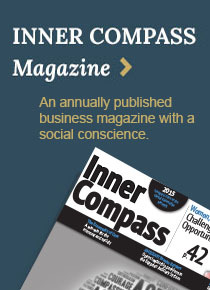 The Inner Compass is an annually published magazine complete with illustrations, data, visual graphics, as well as excerpts of real world case studies. Designed to transcend the static page and spur dynamic dialogue on key issues, the articles included link seamlessly to a multi-media portal. Through the use of these multi-media links the Inner Compass encourages debate and discussion as it focuses on creating value-based leadership as its readers analyze business, human rights, and social justice. 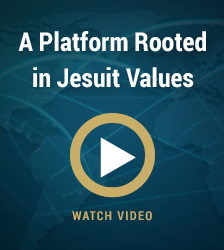 Partnered with faculty, students, and alumni of Jesuit colleges and universities in over 112 countries, The Inner Compass is a companion publication to the Global Jesuit Case Series. The underlying objective of this and all the products we are developing is to transform how we do business, recognizing the narrow focus on shareholders and individual wealth accumulation as fundamentally flawed and unsustainable, and emphasizing instead a more holistic values-centered approach, inspired by the Ignatian principles of service, justice, human dignity, and compassion for others. The inaugural issue of the Inner Compass explores gender inequality and other minority issues, emerging markets, new leadership styles in different parts of the globe. These topics are not only from a human rights/social justice perspective but are in the business context. The content showcases how topics traditionally thought of as social justice has an impact on business vice versa can be impacted by organizational views. Global datasets are used to paint a visual picture of current business trends around the world of work across regions and case studies are used to bring the messages home – featuring inspirational leaders and highlighting policy/business solutions that are making a measurable impact. The intent is only to introduce other ideas of leadership and business-values, and is not intended to be simply a gender or minority rights discussion.